Helmsley is a 12th century Market Town on the edge of 550 square miles of glorious wilderness, the North York Moors National Park. On the River Rye with the district of Ryedale Helmsley boasts a superb example of a double moated castle, a stately home DuncombePark and within a short walk Rievaulx Abbey a stunning early Cistercian settlement founded by French monks. Today Helmsley manages to mix individually owned shops and specialist suppliers with hotels and bed and breakfasts to provide for you the very best that North Yorkshire has to offer. Shopping in Helmsley is a delight with proprietor owned shops offering speciality shopping of the best kind. From food to fashion and art to artifacts the unique shops take great pleasure in selling the best local produce and items sourced from all over the globe. Events in Helmsley take on all sorts of guises. 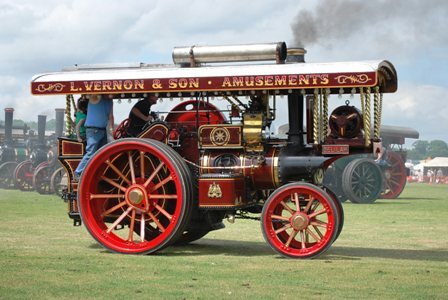 Craft Fairs, Traction Engine Rallies, Antique Fairs, Christmas Markets, Food Festivals, Open Air Performances, Music Festivals, Charity Runs, Car Rallies and lots more. Whether they are held in the Town Square or in the grounds of the stately home or in the sanctuary of Helmsley Walled Garden you are sure of a great day for all the family. At the Traction Engine event in Helmsley every year huge monsters like this one parade for the public. More recently Helmsley is establishing itself as a foodie hotspot’. The Michelin starred Black Swan at Olstead just seven miles away, a very successful ‘deli’ Hunters of Helmsley, the Hotel of the Year, the Feversham Arms, the Plough Inn at Wombleton, Gepettos a small Italian Restaurant run by Dino (now granted honorary Yorkshire-man status) provide excellent food and service. The southern boundary of The North York Moors National Park, over 550 square miles of natural beauty, lies in Helmsley, as do the start and finish of the magnificent Cleveland, Ebor and Inn Ways, three popular long distance walks that extend to you the serious and not so serious walker a spectacular introduction to this unique area. With the recent changes in Tourism the National Park are taking a more pro-active role in visitor welfare and have linked this to a ‘sustainable tourism project’ which promotes all that’s best in the Park in a reusable way and we are very happy to be working with the Park and playing our part, however small, in this important local initiative. Helmsley is in the District of Ryedale one of the most sparsely populated areas of any local authority in England today. So if you are seeking to join the masses and fight your way through crowded streets to enter ‘High Street’ stores you will be disappointed. If alternately you are seeking some quiet relaxation, perhaps some time to walk and think, visit some historic settlements, or purchase a piece of Yorkshire at the Mouseman , your decision to stay in Ryedale at the Carlton Lodge bed and breakfast, probably the best bed and breakfast in Town, is well made. North Yorkshire is a huge area stretching almost from west to coast to east coast. Within its boundaries lie two national Parks the Moors and the Dales, and an unimaginable amount of spectacular rolling countryside. 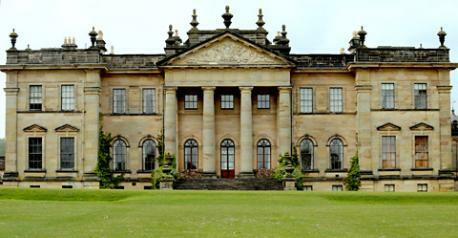 It is also home to many and varied heritage sites ranging from religious monuments like Fountains Abbey to grand stately houses like Castle Howard to indeed the smallest stately home in England today. It also plays host to very many television and film crews some of which have stayed at the best bed and breakfast in Helmsley! So the next time you watch an episode of ‘Heartbeat’ or go to see the latest ‘Harry Potter’ film or watch either version of Brideshead Revisited you can think of the Carlton Lodge for your next short break.